Chairman of the Berbice Bridge Committee, Dr. Surendra Persaud. The Berbice Bridge Company Inc. (BCCI) wants commuters to pay more to cross the river, but the company says government’s ontinued rejection of refusal to increased tolls is affecting maintenance and other operations. If the company gets its way, cars and minibuses will have to pay GY$8,040 to cross the bridge; pickups, small trucks and four-wheeled drive vehicles GY$14, 600; medium trucks GY$27,720; large trucks GY$49,600; articulated trucks GY$116,800; freight GY$1,680 and boats GY$401,040. Asked whether the company has considered the impact of these steep increases can have on ordinary Guyanese, Chairman of the Board of the Berbice Bridge Company, Dr. Surendra Persaud said the rules did not “allow us to pick and choose”. Persaud also declined to say whether the press conference and release of a Private, privileged and confidential letter to the Minister of Public Infrastructure, David Patterson was aimed at giving government a way out of its position that tolls would not be increased. Since the bridge began operations in December 2008, tolls gave never been increased. The coalition campaigned on, among other, promises no increases in tolls and on coming to office in May 2015 facilitated private speedboat operations and paid the bridge company an annual subsidy. The Berbice Bridge Company says the company has so far racked up GY$2.8 billion in losses, causing the company to face “bankruptcy”. “These accumulated losses and shortfall of cash flow have compromisrd the bridge company’s obligation to efficiently operate and maintain the bridge, including the timely servicing of its pontoons under the bridge, and have resulted in the company defaulting on its obligations to investors,” the Chairman of the Berbice Bridge Company, Dr. Surendra Persaud said in a statement. Persaud said investments by the National Insurance Scheme and several pensions schemes and other private investors have become “impaired” and could result in a loss of private sector confidence in government. The Berbice Bridge Chairman said government has violated its contract with the company in the Berbice Bridge Act 2006. “We are in a situation where the contractual obligations of a public private partnership have not been met on the government’s part and, if not corrected, is likely to affect the willingness of the private sector to partner with government in future projects like, for instance, the new Demerara River Bridge and the recently announced power plant to utilize some of the gas found offshore,” he said. In a letter dated July 9, 2018 to Public Infrastructure Minister, David Patterson, the Berbice Bridge Company Chairman said the minister did not even respond to three previous applications on March 25, August 6, 2015 and January 2016. 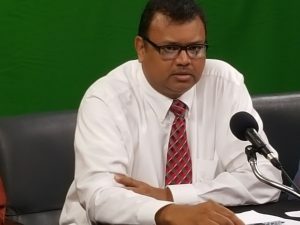 “The Company’s application for toll adjustments continues to be based on the toll adjustment formula prescribed in the concession agreement that toll charges are to be adjusted to provide the company with sufficient cash flows to meet its obligations contracted in the concession agreement under the Act to operate and maintain the bridge,” Persaud told Patterson. Persaud told the news conference that it would welcome government’s assistance to maintain the bridge.